If you are looking for the ALL OR NOTHING EXPERIENCE playing at the Arts Theatre 1, 15 and 29 April 2019, please follow this link. All or Nothing tickets to the Ambassadors Theatre transfer are now available! 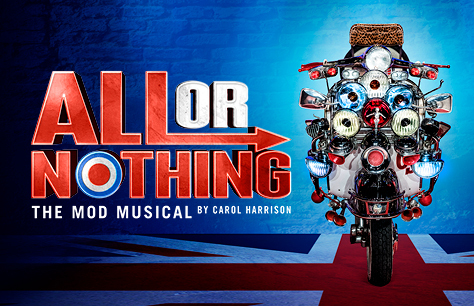 Rock ‘n’ Roll Productions Presents All Or Nothing – The Mod Musical by Carol Harrison the coolest musical ever. Having played to packed houses and standing ovations across the UK, All Or Nothing – The Mod Musical came home to London and played an amazingly successful run at the Arts Theatre and has now transferred to the Ambassadors Theatre. 1, 15 and 29 April 2019. This show contains strong language and flashing lights. What a fantastic show! Characterisations brilliant,.script terrific, music great, and the audience reaction at the end recognised what a good fun night it was. And historically accurate about Steve Marriott and the Small Faces as well!